Varicose veins are as unattractive as they are uncomfortable. 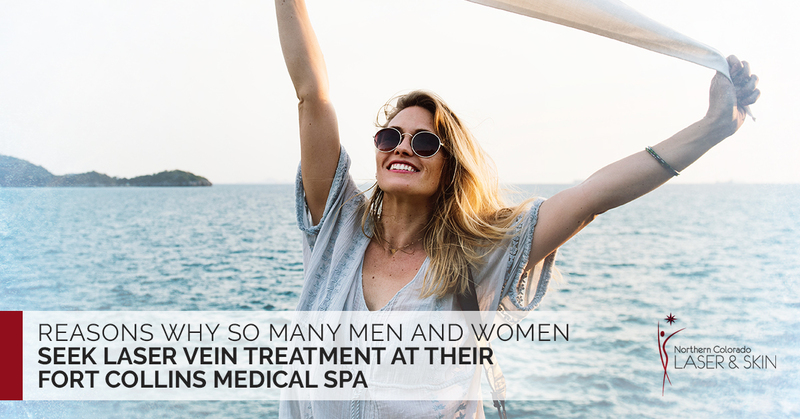 This is the main reason why so many men and women seek laser vein treatment at their Fort Collins medical spa. In the past, treatment for varicose veins meant painful surgery with significant downtime. But modern technology makes varicose vein treatment far easier. Concentrated laser energy is used to eliminate varicose veins and is preferred over other methods. Here are the obvious reasons why. Laser treatment for varicose veins is a procedure that is minimally invasive and involves very little discomfort. Laser energy heats and destroys the veins without any damage to the surrounding skin and tissue. This laser procedure is quick, taking just a few minutes in most cases and does not require anesthesia. Best of all, no pain, no scarring, no stitches and nothing to worry about. For most people, they are able to go back to work or continue their daily activities the day of or the day after laser vein treatment. This means that you can have good looking legs again without having to totally disrupt your schedule. With laser vein treatment, the varicose veins are collapsed and absorbed by the body, this means the veins are permanently eliminated. They won’t come back! And if you do happen to develop new varicose veins, laser vein treatment can be used on them as well. Varicose veins are unsightly and a major problem for some people. Get better-looking legs and feel good again with laser vein treatment. Through minimally-invasive laser treatments, you can say goodbye to your varicose veins and enjoy smoother legs.